I am considering adding a track type bike to my S1000r. I have been reading the R1 forum (and others). And surprise what I've read on there: engine stalling when coming to a stop (you're not alone aprilia!! ), and my favorite as for as this forum is concerned: the infamous (their term) "noisy cam chain tensioner issue". Seems their are loud and need to be monitored as well. There were other issues. Another favorite note I read about the highly reliable Honda VFR. The thread comment was two riders discussing ridability on a tour in Europe. The VFR owner said his bike is very reliable except for the stator (I think). It is so prone to failure that he always has a spare on his bike ! Now, I'm sure the R1 is reliable (now) but nothing is perfect. And I do hope that I have one of the reliable s1kr bikes since Ive seen and heard about many. 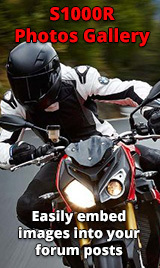 I think the real reason people say its a good idea to get an extended warranty with BMWs is that parts and dealer repair is VERY expensive relative to other bikes. And don't forget, many japanese bikes are very simple with minimal electronics and use old parts made of inexpensive materials. I am no expert but I have read a lot about Hondas (and owned some) and their are very basic bikes with minimal tech. They also are not perfect. My cbr650 went kaboom on me after only 25xx miles in the winter. Well, it wouldn't start and the dealer said something about the cylinders leaking oil or something that fouled plugs. I never really knew what the issue was but it failed to start and required the engine to be taken apart to fix. Also, my beloved daytona 675 developed a noisy cam chain that I'm told was ready for replacement at about 9xxx miles. Yeah my 09 R1 had cam chain tensioner issues. So did my '10 Daytona 675. Triumph also had stator, rec/reg issues. Mine didnt play up but had to take it in and have work done as part of a recall. Let’s be honest - this bike is phenomal - however BMW and this model have a fairly extensive list of known faults. Yes, you can be unlucky with any bike, but for each bike I’ve had and their respective forums they were nowhere near this level of issues.But I knew what I was getting into before I bought. If you dealer service and maintain warranty, happy (but expensive!) days but let’s not be under any illusion. If you look at the 2014 threads you can see what has been gradually fixed on the Mk 1 over the last 4 years - but the same faults still present, its just that BMW now have a process for common fixes (cam chain tensioner, switch gear, soft cams, fork seals, coolant blows). I’ve opted to stay with the bike another year, as there’s not a comparably performing bike at the same value point doing it. So be aware but enjoy too ! I purchased the extended warranty when I got the bike. It's for peace of mind and I plan on keeping it for a long time...A few hours labor working on the bike could easily get expensive so why not? I don't do everything as far as maintenance on my bike so it just made sense for me. They probably have read this forum and all the negative comments. You got no chance now! I'd probably gouge my own eyes out with a popcicle stick than expose myself to the frustration of dealing with test pilots and low ballers (since I could get that from the dealer, lol) that come with selling bikes privately, past experiences were not good. Picking up the bike tomorrow. Hopefully it is as advertised as it is a killer deal. Then I have 14 days to decide if I want extended warranty or not. Right now I'm leaning toward the warranty. Get the warranty so that you will never need it. If you don't, it will fall apart on the ride home.